Baghuz (Agenzia Fides) - Syrian Orthodox priest Samuel Gümüs, engaged in the pastoral care of the Syrian Orthodox communities present in Germany, declared that the Orthodox Syrian Metropolitan of Aleppo, Mar Gregorios Yohanna Ibrahim, is held prisoner by the jihadist militiamen of the Islamic State ( Daesh) besieged in the Baghuz area of eastern Syria, and "negotiations" for his release are under way. The statements of Father Samuel are reported by Lebanese newspaper al-Akhbar, close to the Shiite Hezbollah Party, a newspaper that some days ago also mentioned Kurdish sources, according to which Roman Jesuit Father Paolo Dall'Oglio is among the hostages of the militants of the Islamic State (Daesh) in that last pocket of territory controlled by the jihadists (see Fides, 4/3/2019). 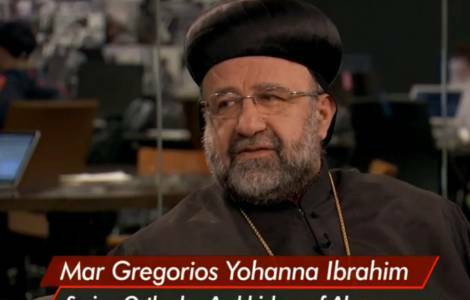 Father Samuel Gümüs, in the statements reported by al-Akhbar, refers to "negotiations currently conducted by the democratic forces of Syria and by the forces of the Allied coalition" in order to also favor the release of Mar Gregorios. The same Lebanese newspaper reports that the veracity of the information widespread is difficult to ascertain, even for the absence of official statements by the military forces operating in the area.